Charlie’s Pride Roast Beef is tender and juicy. Each Roast Beef is seasoned to perfection with the finest spices available, then hung in traditional netting and slow cooked in state-of-the-art smokehouses to exact internal temperatures. The result is a roast with an appetizing appearance and an unsurpassed home-cooked flavor. And the majority of our Roast Beef is 95% fat free. 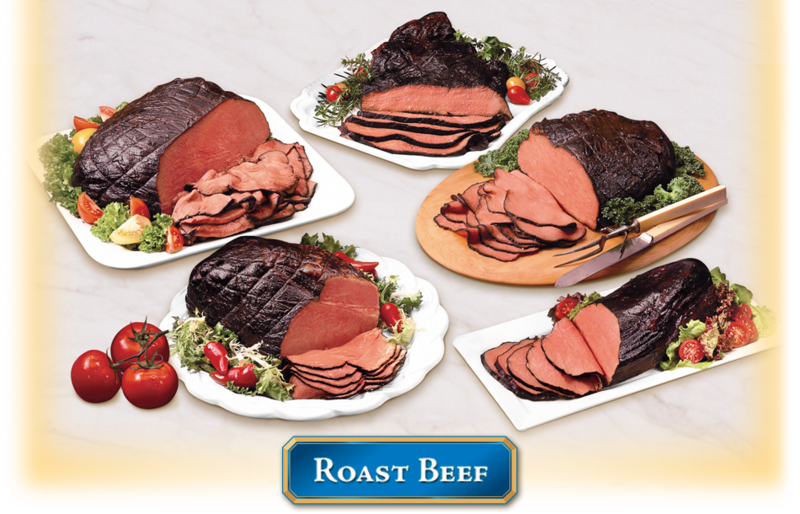 You can feel confident that you have chosen the world’s best Roast Beef. All of our Roast Beef items have 0g Trans Fat, No Added MSG, and can be custom oven-roasted from rare to well-done to accommodate our valued customers. Leanest cut, most tender and juicy. Available non-injected, seasoned (back-to-beginning weight), or with a 10%, 15%, 20% solution, or isolated soy protein added. Sold whole (8-12 lbs) or deli-faced (4‑6 lbs). Leanest cut, uniform sandwich shape and size. Larger than Eye of Round. Available non-injected, seasoned (back-to-beginning weight), or with a 10%, 15%, 20% solution, or isolated soy protein added. Sold whole (8-12 lbs), deli-faced (4-6 lbs), or in quarter-piece chubs (2‑3 lbs). Most flavorful item. Seasoned and cooked to perfection. Available non-injected, seasoned (back-to-beginning weight), or with a 10%, 15%, 20% solution, or isolated soy protein added. Sold whole (8‑12 lbs). Available non-injected, seasoned (back-to-beginning weight), or with a 10%, 15%, 20% solution, or isolated soy protein added. Sold whole (4-8 lbs) or in quarter-piece chubs (2‑3 lbs).